Finish Up Friday: 2015 Edition – Look! Ellie’s Doll Has Hair! In January/February 2014, I had a very productive two months as I held my “list of shame” up for public view, keeping you updated as to how I was doing with all my unfinished sewing projects. I had good intentions of doing the same for February 2015 but here we are, halfway through February and this is my first “Finish It Up” post. Although you haven’t know about it, even the threat of doing this has been good for me. I do have some finishes to report along with a long list of work still yet to be done. Of those three things, only two of them have been finished in the last eleven months. 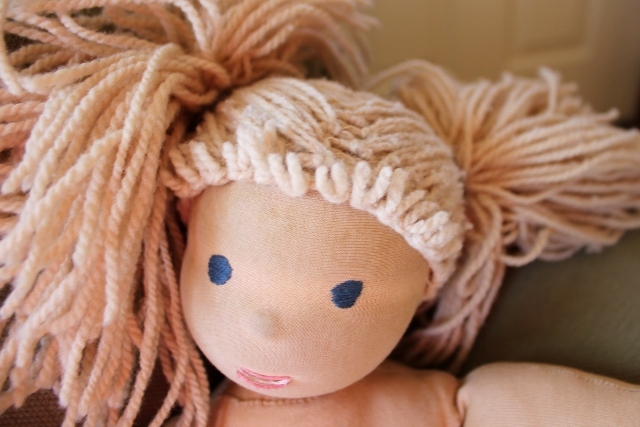 Ellie’s doll hair, I did indeed finish last spring. My new corduroy pants? I hemmed them this morning. (Nothing like the threat of confessing abject failure to get something done!) But, why oh why can I not find he will power to finish those shades?!?! Our rule for Baby’s hair is “always in a pony tail or pigtails”, otherwise, I know the yarn would get trashed. It’s held up pretty well so far. 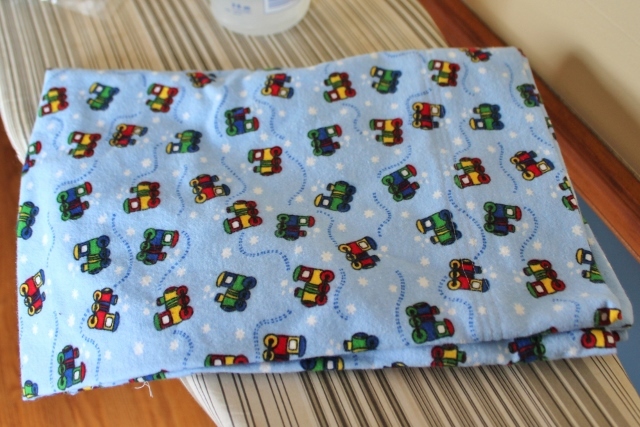 Here’s another finish I can cross off my list already – one more pillowcase for Mark. Now that I’ve made myself feel better by telling you what I have accomplished recently, here’s the list of projects I need to finish. Mark’s doll hair, because yay! The doll is done! 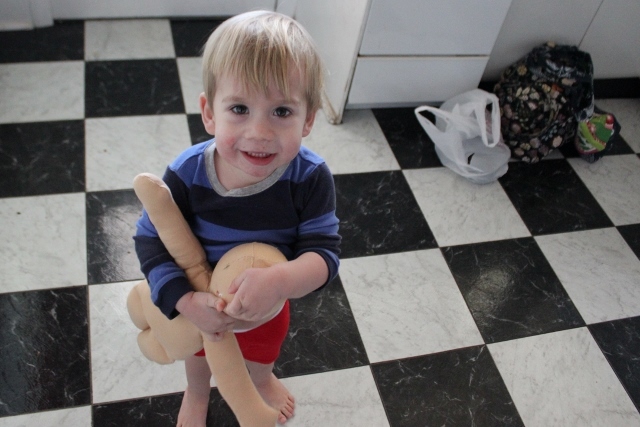 a sneak preview of the doll (who is nursing), sans hair. P.S. You may notice that what is not on either list above is Ellie’s “to be finished after Christmas” Christmas present. I showed her the book recently with the project I wanted to make for her (a hooded play cape) and she told me quite definitively that she doesn’t want one of those things. So, there you go. It’s a good thing I wasn’t able to finish it (or even start it) before Christmas! And I meant to linke up with Finish It Up Friday at Crazy Mom Quilts but I forgot to do it. I’ll be back next Friday to let you know how I’m doing! This post contains at least one affiliate link, meaning any purchases you make with it supports our blog. See the full disclosure here. This entry was posted in Mark, sewing and tagged Finish It Up Friday, Growing Up Sew Liberated. Bookmark the permalink. 7 Responses to Finish Up Friday: 2015 Edition – Look! 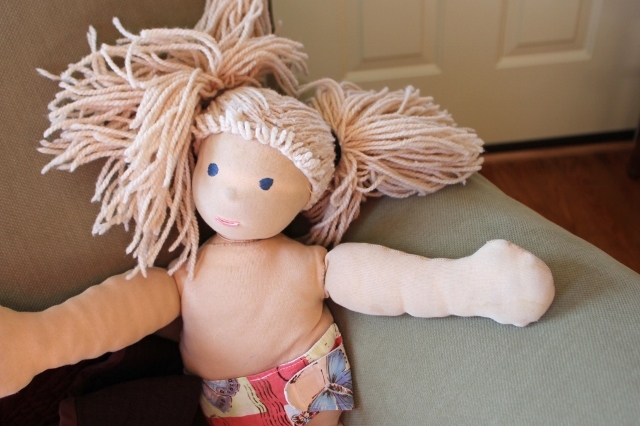 Ellie’s Doll Has Hair! Love love love Ellie’s doll’s hair! Cute!